When stars are portrayed in media, they are often shown with long spikes emanating from them. Perhaps the most common example is that of the “star of Bethlehem” which, according to the story, led the wise men to baby Jesus. Of course when we look at stars in the night sky, we don’t see any such spikes. Stars twinkle due to atmospheric disturbances, but that’s about it. 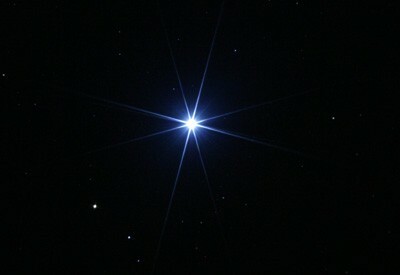 In photographs, however, bright stars often have such long spikes. So what causes them? It all has to do with an interesting bit of optics. 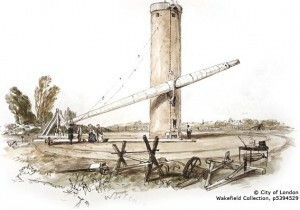 The Craig lens-based telescope was 85ft long. In astronomy, they are known as diffraction spikes, and they appear with certain types of telescopes. Optical telescopes broadly fall into two types: lens-based and mirror-based. Lens-based telescopes were the first to be developed, and are basically a long tube with two or more lenses. Starlight is refracted by the lenses to produce a magnified image. Since the light goes straight through the telescope unimpeded, you don’t get any spikes on stars. The big disadvantage of lens telescopes is that they tend to get be fairly long for large magnifications, and large lenses are difficult to make well. The mirror supports on my telescope. Mirror-based telescopes are easier to make, and because they reflect light they can be made shorter. Light can be focused from a large back mirror to a smaller mirror, which then focuses the light onto an eyepiece or camera for viewing. One downside of this type of design is that starlight has to pass the smaller mirror before reaching the large back mirror. As it does, the supports for the mirror cause the light diffract. It’s the diffraction pattern that causes stars to appear spiky, hence the term diffraction spikes. Normally diffraction spikes aren’t noticeable. When viewing objects directly you won’t typically notice them. But with long photographic exposures they generally show up. Even professional telescopes have them in many of their images. They generally aren’t a problem for research, and the advantages of mirror telescopes vastly outweigh the minor inconvenience of diffraction spikes. But the main reason we see diffraction spikes so often is that astrophotographers often use them to artistic effect. They transform a bright point of light into a wondrous stellar image.